One hundred and fifty homemade mega marshmallows calls for the mother of all hot chocolate parties. 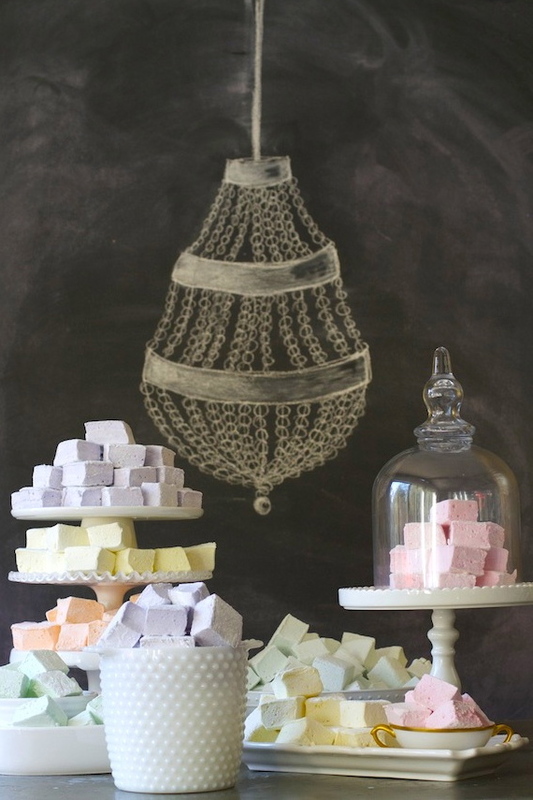 Pile your colored and flavored boulder-sized marshmallows up in beautiful containers on one table (I chose all white to show off the subtle colors of the marshmallows). On another table, have a platter of various cups (no need to match…ever) and a huge bowl of the best hot chocolate you have ever made. Don’t have a fancy chandelier to hang over your tables? Grab a piece of chalk and draw your own. Lightly coat an 8×8 baking pan with non-stick cooking spray and set aside. In a small bowl, sift together the corn starch and powdered sugar. Use half of the mixture to coat the sprayed baking pan. Set aside. Pour 1/2 cup cold water into bowl of standing mixer fitted with whisk attachment. Sprinkle the gelatin over the water and let stand until gelatin softens and absorbs water (about 15 minutes). In a heavy saucepan over medium-low heat, add the remaining 1/2 cup cold water, sugar, corn syrup and salt. Stir mixture until the sugar dissolves, you may need to brush the inside of the pan with a wet pastry brush if sugar crystals begin to form. Clip a candy thermometer to the side of the pan and increase the heat to medium-high. Boil the mixture, without stirring, until the temperature reaches 240 degrees F (about 8-10 minutes). Turn on the standing mixer to a low speed and gradually add the hot syrup to the gelatin mixture (pour it down the sides of the bowl and not on the whisk). Gradually increase the speed to high and beat until the mixture becomes super thick (about 15 minutes). Add extract and just the smallest bit of food coloring to tint the mixture. Beat for another 30 seconds or until it’s all incorporated. Scrape the mixture into the prepared pan. Use a wet offset spatula to smooth the top. Do not cover and let stand at room temperature overnight. Dust the top of the marshmallows with some of the remaining cornstarch and powdered sugar mixture and use the rest of the mixture to generously dust a work surface with. Turn the marshmallow slab out of the pan and onto the dusted work surface. Using a sharp chef’s knife, cut the square into 4 strips. Then cut the 4 strips into 4 separate squares so you have 16 big thick marshmallows. Don’t worry if you have to squish the marshmallows a bit while you cut them, they spring right back. Toss the marshmallows in any remaining cornstarch powdered sugar mixture you have left. Place on a plate and allow to continue to dry at room temperature. When the marshmallows are completely dry, place in an airtight container. Use extracts (preferably homemade) to flavor your marshmallows. 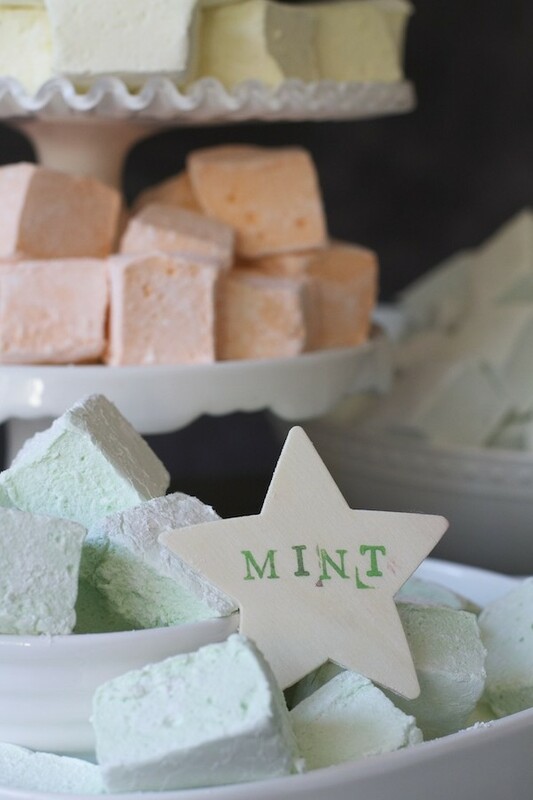 Here, I’ve taken a wooden star and stamped on the flavor of the marshmallows so my guests know what to grab. I hope they try them all: Green is for mint. Purple is for lavender. Rose is for pink. Orange is for orange. Butter is for yellow (yes, you can buy a butter extract). Vanilla is for blue. Creative Director, Producer, Stylist, Writer. Get the latest from Libbie! Stay up-to-date with the latest recipes, photoshoots, videos and much more!